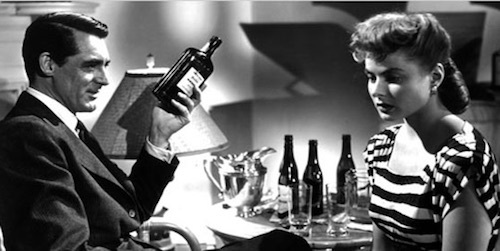 Along with Casablanca, Notorious is the film that assures Ingrid Bergman’s immortality. Set in the Rio of 1946, she plays Alicia Huberman, a woman whose ‘notorious’ reputation encourages US agent Devlin (Grant) to recruit her to infiltrate the Nazi spy ring led by Sebastian (Rains). Bergman is perfectly cast, while Hitchcock’s writing and direction are at their best. The plot is ingenious, but very much ‘of its time’ – film historians speculate whether the villains of the piece would have been communists rather than Nazis had the it been written 6 months later. The expert direction also manages to smartly sidestep the Hays Code restriction (no kiss shall last more than 3 seconds) to get a 3 minute smooch onto the screen. 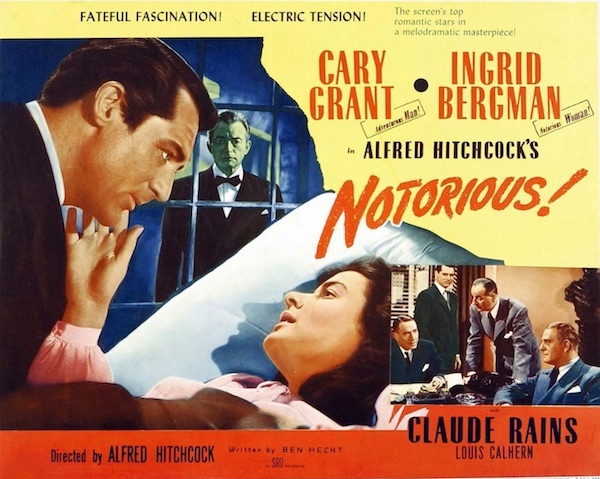 And Hitchcock’s trademark, precisely choreographed visuals ratchet up the tension.